The joongbong, or short stick, is the most versatile and easy to learn weapon. Once mastered, the principles of the joongbong can be applied to any blunt weapon. The Joong Bong Fundamentals & Patterns DVD covers the fundamentals and basic patterns (hyung) of the joongbong including: offensive and defensive stances, proper grip, blocking and deflecting, striking, cutting, thrusting, footwork, fundamental applications, offense and defense drills, partner drills, and empty hand drills. 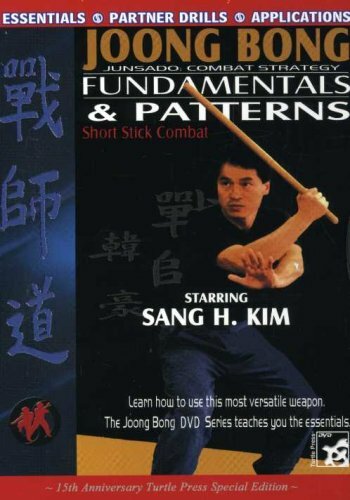 Once you have mastered these fundamentals, continue your joong bong practice with the three basic patterns, blending striking, thrusting, blocking and footwork techniques into a flowing pattern of offense and defense. No matter which set of skills you want to work on, the fully indexed DVD format allows you to jump directly to them and get to work! If you have any questions about this product by Turtle Press, contact us by completing and submitting the form below. If you are looking for a specif part number, please include it with your message.